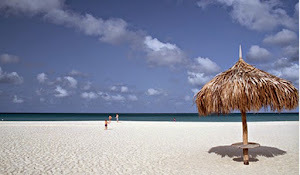 Aruba in the southern Caribbean has 107,000 people, a lot of wind and sun and, until very recently, one very big problem. Despite the trade winds and sunshine, it was spending more than 16% of its economy on importing 6,500 barrels of diesel fuel a day to generate electricity. People were furious at the tripling of energy prices in 10 years and the resulting spiralling costs of imported water and food. That changed at the Rio earth summit in 2012, when the prime minister, Mike Eman, announced that the former oil-producing Dutch island close to Venezuela planned to switch to 100% renewables by 2020. Working with the independent US energy group the Rocky Mountain Institute and the business NGO Carbon War Room, Aruba ditched its old steam turbines for more efficient engines and changed the way it desalinated seawater. It cost $300m (£183m), says the energy minister and deputy PM Mike D’Emeza, but Aruba immediately halved its fuel consumption and saved itself $85m a year. It then built a 30MW wind farm and cut its diesel consumption a further 50%. Now it is planning another wind farm and a large solar park. By 2020, Aruba will be free from fossil fuels and possibly storing renewable electricity under water or using ice. The move to energy independence has had dramatic results, says De Meza. Electricity prices, which were US 33c/ KwH in 2009, have dropped 25% and are stable; inflation has been reversed; the island has nearly paid off the $300m it cost to switch out of diesel; the price of drinking water has fallen by almost a third; and the number of people unable to pay their bills has declined drastically. “We had been grappling with very high energy costs for 15 years. We realised that our dependency on fossil fuels was leading to political and economic instability. We had to act,” De Meza says. Many other Caribbean islands are eager to follow Aruba. Some in the region pay more than 42c/ kwh – three or four times the price paid in most of the US and Europe – and up to 25% of their GDP on diesel for electricity. Many are also locked into long-term contracts with monopolistic US or Canadian utility companies which have negotiated 17% or even higher guaranteed profit margins. “We are very concerned about the high cost of energy and how it affects jobs,” BVI prime minister Orlando Smith adds. St Lucia plans over the next 10 years to switch much of its electricity from diesel to renewables, using geothermal, wind and solar power. The government will make it easier for people to generate their own electricity to reduce diesel demand, and changing street lights to LEDs could reduce costs by $11m a year, he explains. “Renewables will provide new jobs, everyone will have more money in their pockets, transport will be cheaper and companies will be able to expand more easily,” Fletcher says. “Islands can get prices down to just 12c/ KwH,” says Ed Bosage, a wealthy American financier who bought the small island of Over Yonder Cay and who has switched it to 96% renewables with wind, solar and a tidal generator. “The wind blows at an average of 16 knots. The tidal is extremely reliable. We learned that wind trumps sun by 2:1. We now produce electricity for 12c, the cheapest in the Caribbean, and will get it cheaper. It’s repeatable everywhere,” he says. Caribbean islands share similar problems to thousands of others in the Pacific and elsewhere. Mostly, they are not on national grids, which makes them vulnerable to high energy costs, fuel has to be imported at extra cost, and they are often reliant on just one utility company and most are too small to benefit from economies of scale. While some can attract high-spending tourists and offshore finance companies, small island states are often heavily indebted, with weak economies, pockets of intense poverty and often rundown hospitals and schools. Jamaica is investing heavily in wind, Barbados in solar power and eight island states – Aruba, British Virgin Islands, Dominica, St Kitts and Nevis, Grenada, St Lucia, Turks and Caicos,and the Colombian islands of Providencia and San Andreas have joined the Carbon War Room’s “10 island challenge”. This gives them access to technological and funding help from the Rocky Mountain Institute and others. Category/ies:Barbados News, British Virgin Islands, Dominica News, Grenada News, Jamaica News, News, St Kitts and Nevis News, St Lucia News, Turks & Caicos News.